Almost like it’s the law, Monday is almost always chest day. You’re ready to start your week and begin lifting again, so you have a lot of energy and what better way to spend it than starting your week off with an awesome chest pumping experience! Sometimes though, chest exercises can consume a lot of time, so we use supersets to cut it shorter by about half, since you’ll be doing two sets for the time it takes to do one without using supersets. Also, this type of workout has another advantage – you train with far greater intensity which means that your muscles will grow even larger during your time of recuperation. All of these supersets have two basic components – a pressing exercise and a fly movement. The difference is the order in which they come and the combination with other exercises. You want to shock your chest muscles, so you better get ready to switch up your routine. The training regimen starts with free weights and then goes into machine exercises as well as bodyweight exercises. When you have the most strength and energy, free weights will have the best effect on you, but when you’re getting tired by the end, machines and bodyweight will help you complete your workout without losing either focus or intensity. As supersets go, you shouldn’t rest between two exercises and no more than a minute between the supersets. First of all, you will need to warm up. That never means just doing the rotator cuff warm-up and some stretching – it means that you need to get your head in the game before you start working on your body. If you’re having a lousy day, let all your negative energy out when you start exercising. You need to work out at 100% in order to get the best results – simple rules of input and output. Of course, you will need to warm up physically as well, so get your triceps, elbows and shoulders ready for some intense lifting because they are definitely going to participate in the workout. You can never develop your upper chest enough, so make sure you start with two incline exercises when you are at your best and strongest right when you start your workout. Working with a barbell will let you lift more weight, which means that the incline barbell presses should go first. When you’re done with them, take a pair of dumbbells that you previously selected and do the incline flyes with them. Make sure to adjust your seat on the bench so that you don’t accidentally hit the barbell. 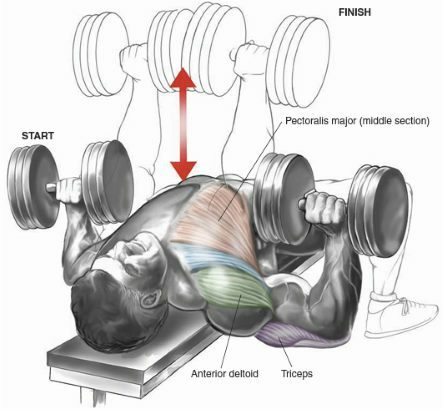 If you have to, use another bench, but you will need to lower the settings so that your chest is worked on from a new angle. Shocking is always good. Remember – the reps get fewer, and the weight gets heavier. Since you’re training with extra intensity, you might lack the strength or stamina to do both of these exercises back to back, so make sure that you adjust the weight to the one you need in order to not get hurt. Do this superset three times with 10, 8 and 6 reps of each exercise, respectively. For the second superset, use two flat-angle exercises. 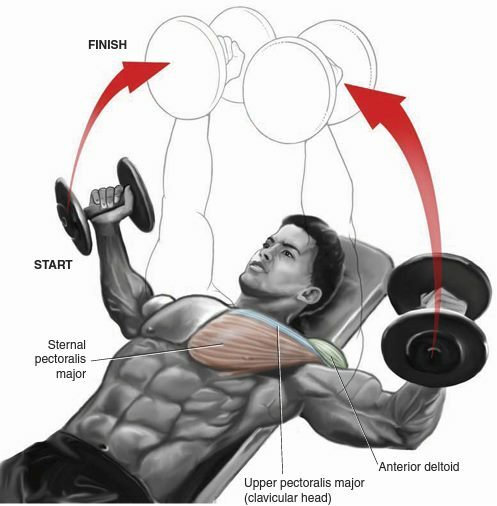 Take a pair of dumbbells and do your flat flyes, which will stretch out the lower part of your chest and get it ready for the blood coming into them from the presses you’ll be doing. When you get to the 10th rep of your flyes, start doing presses with the same dumbbells and same weight on them. Contract your chest at the top of the press and don’t lock your elbows out – it will make the triceps take over and you don’t want that. Do two sets like this. For the third set, go to muscle failure. If you can get 10 reps that’s good, but if you get more than 15 you need heavier dumbbells. If you don’t get 10, it’s okay. When you take your flyes to failure, do as many presses as you can. When you can’t do a single rep more with perfect form, get someone to spot you and help you do at least two more. When they’re lifting more than you are, the superset is over. This superset is different than the rest for two simple reasons. First of all, you won’t be counting reps – you’ll be counting time under tension in seconds and second – you’ll be using non-traditional exercises. The standing plate presses will have you holding two small plates together (5s or 10s). Squeeze them together between your palms and stretch out your arms in front, as if to do a press. 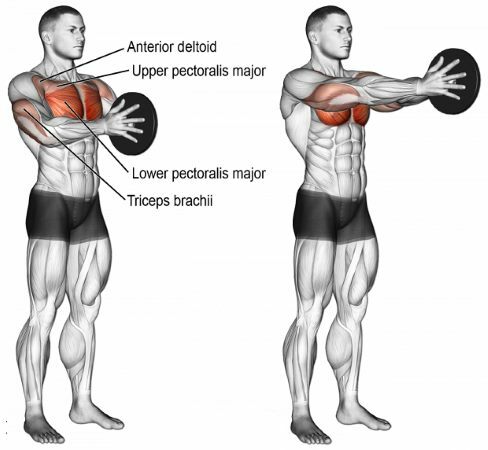 You will need to pump your pecs while you do this, so make sure to squeeze them. Do these presses for 30 seconds without counting how many reps you do. When you’re past those 30 seconds, get a body suspension training band and do some bodyweight flyes for 30 seconds. If your gym doesn’t have body suspension training bands, use a resistance band and do standing flyes for the same duration. You will need three supersets of 30 seconds per exercise in order to get this done. When you get to this point in your workout, weight and strength start to fade out and all you need to do is tear your muscle fibers as much as possible, so you can shift to machines. These exercises will isolate your muscles and you will be able to do enough reps while avoiding getting hurt in the process. 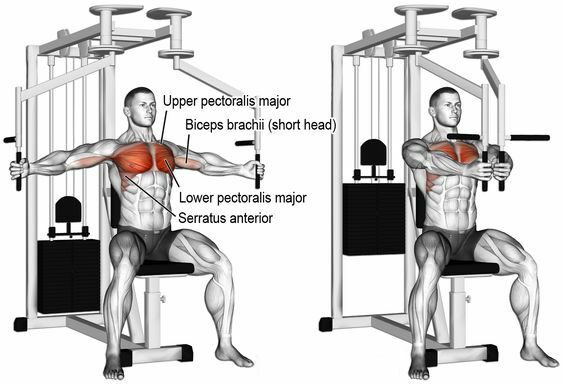 This is where the pec deck comes in – you should focus this workout on your chest, so don’t bring the handles together. When you’re done with that, head on over to a machine press with a seat if possible. Press horizontally so that you don’t exhaust your shoulders and work on your chest instead. Make sure that your shoulder blades stay together at all points and stick your chest out as much as possible. Do 3 supersets with 12 reps per exercise, per superset, and you will feel the results. This is the final superset, so you know you’re almost done and that will get your spirits up. The advantage here is that you barely have to do anything to transition from one exercise to the other. If you’re working out at a crossover station, just drop down and do the push-ups immediately afterwards. When you get to this point, those few seconds in transition can mean the difference between an alright workout and a great one, so make them count! 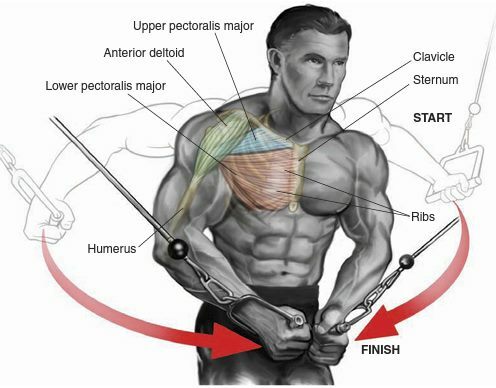 Cable crossovers will be awesome for your lower chest and you’ll be able to keep them under pressure during the entire set since the weights you’re lifting won’t connect with the stationary weights below them. When you’ve finished with this, get on the floor and do some push-ups. If needed, transition to partials or your knees, but even if your ego is too big for that, it will be worth it when you see the awesome new gains you’ve achieved because of these supersets.